This Sunday we celebrate the Epiphany of the Lord, his manifestation. In the East, this is the bigger feast. Though we read the Prologue of John’s Gospel at the daytime Mass on Christmas, it was nine months ago, at the Annunciation, that “The Word was made Flesh and dwelt among us.” What happens at Christmas is that we see him. At the midnight and dawn Masses for Christmas, we read Luke’s story of Jesus’s appearance to the shepherds; at Epiphany we read Matthew’s story of Jesus’s appearance to the nations, represented by the kings. The readings are there for us to hear. He comes to the altar for us to see, and touch, and taste. He is made flesh to be united to us. 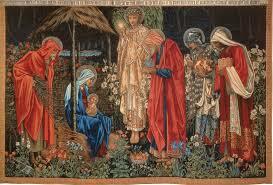 And so we celebrate Christmas and Epiphany: Christ born for us. The differentiation of these feasts nicely takes us into the differences among the Gospels. Matthew’s Gospel, which tradition believes was written first, is the straightforward Gospel. Matthew organizes Jesus’s teaching into five neat sermons (the Mount, the parables, the Church, missionaries, and the end of time), paired with appropriate signs, opening with the birth told from the perspective of the father (Joseph), and closing with the Cross and the Resurrection. Neat and clean. Mark cuts to the chase. He is short. The writing is actually very tight, very clean. There is no nativity: it opens with John the Baptist, like a lion’s roar. And it rushes forward: the constant refrain is “then immediately,” and no one recognizes Jesus until the Cross. Mark wants us to know that in real life, it wasn’t so neat and easy to understand as Matthew tells it. What Matthew says is true – but Mark takes us into the drama. Luke then takes us into the theology: where Mark emphasizes the Cross, Luke focuses on grace. Luke is the Gospel of poverty. His nativity story tells us not about the kings, but about the shepherds; he tells us about the stable (and his symbol is the ox). Christmas, when we read Luke, is the poor man’s Epiphany. The Epiphany that we celebrate this week is the more respectable one, with Jesus in the company of kings – and the more straightforward consideration of Christ’s appearing. John, the eagle, rewrites it all with high-flying theological commentary: his nativity story is “in the beginning was the Word,” just as he glosses the institution of the Eucharist with the Bread of Life discourse (in chapter 6), the washing of the feet (chapter 13), and the farewell discourse, culminating in chapter 17: communion as “may they be one”. Each Gospel tells the truth, but each selects its material to make a particular kind of theological point. So what is the theological point of Matthew’s Epiphany? If Mark’s theme was “no one understood,” Matthew’s theme is “all the signs were there: they should have understood.” He has appeared! The Birth of the Messiah appeard to Gentile and Jew. The magi – pagan wise men – “saw his star at its rising and have come to do him homage.” And when they come to Herod, all the learned Jews tell him “the Christ was to be born . . . In Bethlehem of Judea, for thus it has been written through the prophet” – and in case we’re unsure, Matthew quotes the prophet at length. They should have known! But Herod “sent them to Bethlehem” – he did not go himself. He did not go, of course, because he did not want to do what they did: “They prostrated themselves and did him homage. Then they opened their treasures.” He wanted to be king. We should let Jesus be king for us. “Nations shall walk by your light, and kings by your shining radiance. . . . The riches of the sea shall be emptied out before you, the wealth of nations shall be brought to you,” says Isaiah. In our reading from Ephesians, Paul adds, “the mystery was made known to me by revelation. . . . It has now been revealed to his holy apostles and prophets by the Spirit.” Thank God he has been revealed! And what is that revelation? “That the Gentiles are coheirs, members of the same body, and co-partners in the promise in Christ Jesus through the gospel.” The revelation is precisely that we are called from every nation to see him. Christ is born for us. Deo gratias! Christ dwells among us. In your daily life, how could you better join the kings and the shepherds, go to see his glory?